Sung-Hee Choi (r) holding a banner at navy base construction site, Jeju Island, Korea. The next court date in the continuing trial of imprisoned Korean peace activist Sung-Hee Choi has been twice-postponed, and is now set for July 15. Sung-Hee has been jailed since May 19, and has twice engaged in week-long prison fasts to highlight opposition to the construction of a naval base at Gangjeong village on Jeju Island. She is also demanding that police dismiss her fabricated charges and apologize for her illegal arrest: she was simply holding a protest banner at the time, which read “Do not touch any stone or any flower”, while others have repeatedly engaged in direct nonviolent resistance against construction crews and equipment. The Korean government denies the base is intended for use by U.S. forces, but its strategic location between Japan and China, coupled with long-standing agreements granting U.S. ships access to Korean ports, make Jeju a likely port for U.S. ships outfitted to intercept Chinese missiles. During her imprisonment, nonviolent resistance to construction activity has continued. Blockades of roads and construction equipment are a daily occurrence as the Gangjeong villagers struggle to protect their fisheries and the unique soft coral coastal marine environment. On June 20, the mayor of Gangjeong village, Mr. Gang, and a resident, Mr. Song, were assaulted with sticks and water cannons when they tried to board a dredging boat, and Song was hospitalized to treat his wounds. 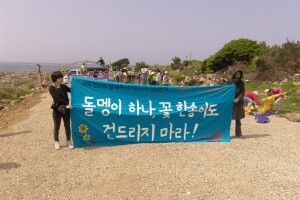 The Global Network Against Nuclear Power and Weapons in Space sent board member MacGregor Eddy to Jeju in June to continue promoting international solidarity with the islanders. Letters of support can be sent to Sung-Hee Choi at the prison address listed here. For more information about Sung-Hee’s trial and the ongoing resistance to militarism at Jeju Island, visit www.space4peace.blogspot.com and nobasestorieskorea.blogspot.com.